iOS - At the bottom of the Settings pane. Android - At the bottom of the Settings pane. Mac - In the menu bar, under Paprika Recipe Manager -> About Paprika Recipe Manager. Windows - In the menu bar, under Help -> About. iOS - Go to your iOS Settings -> Paprika. The version number will be listed under About. Mac - Open Finder, and go to your Applications folder. Select Paprika Recipe Manager. The version number will be listed in the Finder window. Windows - Open Control Panel, and go to Programs. 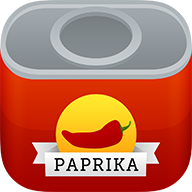 Select Paprika Recipe Manager. The version number will be listed in the Programs window.